Introduction of Taiwan Coretech Inc. Established on March, 2003. Taiwan Coretech Inc. build its headquater in Taipei and has branch offices in central and southern Taiwan. The central branch office occupies the area of 5000 square meters and has 40 technical personnel 24HR stand by to provide the solution and cope with the requirements from various customers. We provide the services include study, investigation, planning, design, inspection, construction supervision, project management and turnkey contract on pipes, flange, valves and any other equipments in refineries and petro-chemical plants. Taiwan Coretech Inc. is the first company that brings flange machining into Taiwan, today the biggest flange we can do is 120”. We accumulate lots of experience in Taiwan’s major oil refinery and petro-chemical company such as Formosa Group and CPC. Soon after the success of flange machining, we combine flange machining, smart bolt technology and our knowledge in gasket and packing together with ASME or API code to establish Joint Integrity Programme (JIP) for flange. With JIP, the customer can get enough assurance of flange safety and preventation from any unnecessary lost during operation. 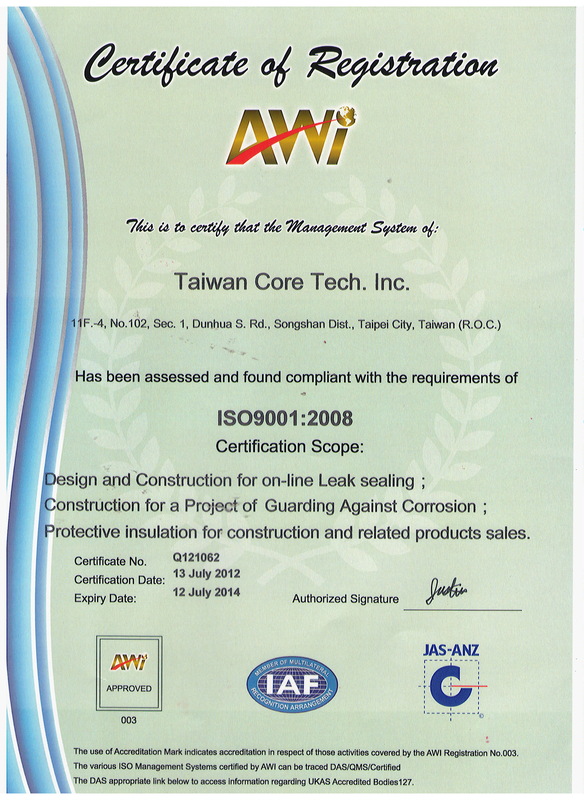 Taiwan Coretech Inc. has been awarded an international certificate of the ISO 9001 Quality Management System. We have always committed ourselves to our corporate culture of "top-quality, high-efficiency professionalism" to fulfill the client's requirements of reliable services. We are a total customer driven company and we strive hard to achieve total satisfaction of our customers. For years, we have focused on solving leaksealing and corrosion issue in harsh environment.We are looking to use the best product with our experienmental technical personnels to help the customers reach the biggest profit and the lowest cost.